We recently had some friends over for drinks and dinner later on in the night so I wanted to make a couple of things I knew would be crowd pleasers. Our friends that were visiting have provided us with great hospitality and meals in the past and I wanted to do something special for them. Two things instantly came to mind: carnitas and ceviche. 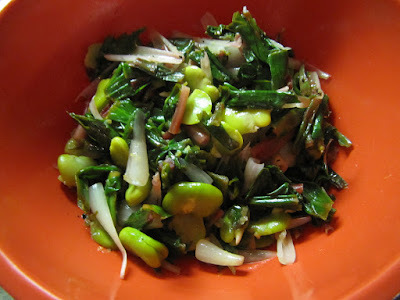 Its being spring also made me think to make a salad with ramps and fava beans. Carnitas to me are a fail-proof solution for any gathering. I mean, who doesn't love crispy fatty pork? I remember having family get togethers where my uncle would fry up chunks of pork (and other random meats) outside in a huge copper pot with boiling hot lard. Once it was cooked the meat was perfectly juicy and fatty. When I lived in Mexico, one of my favorite shops sold carnitas stuffed into a bolillo with nothing else but a few slices of pickled jalapeños. 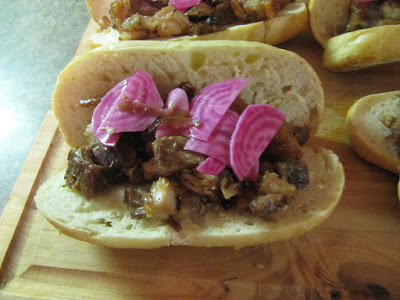 I thought it would be a great idea to make mini carnitas tortas with pickled beets and jalapeños. 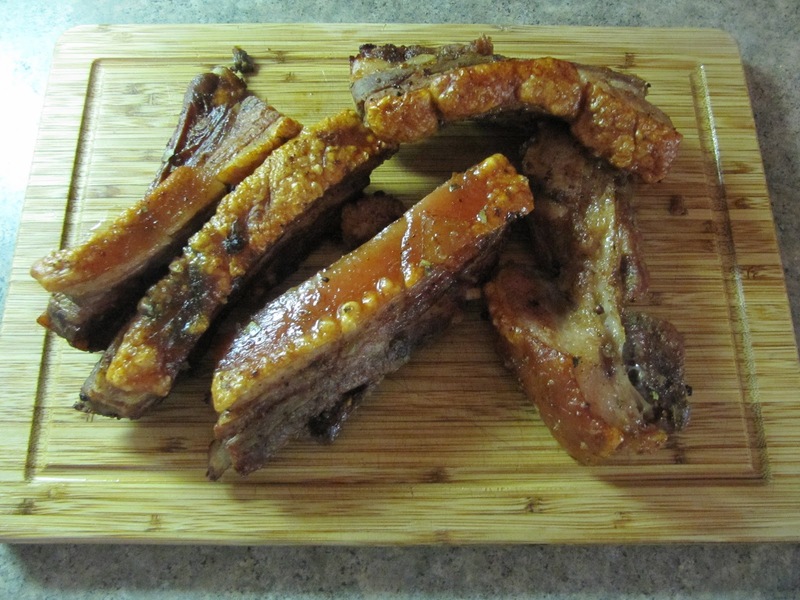 I've found an easy and equally delicious way to recreate carnitas in my oven at home using everyones favorite: pork belly. To begin I seasoned pork belly with skin on with garlic, salt and pepper and roasted in the oven first at a low temperature for a couple of hours, then cranking it up for the last half hour to crisp up the skin. 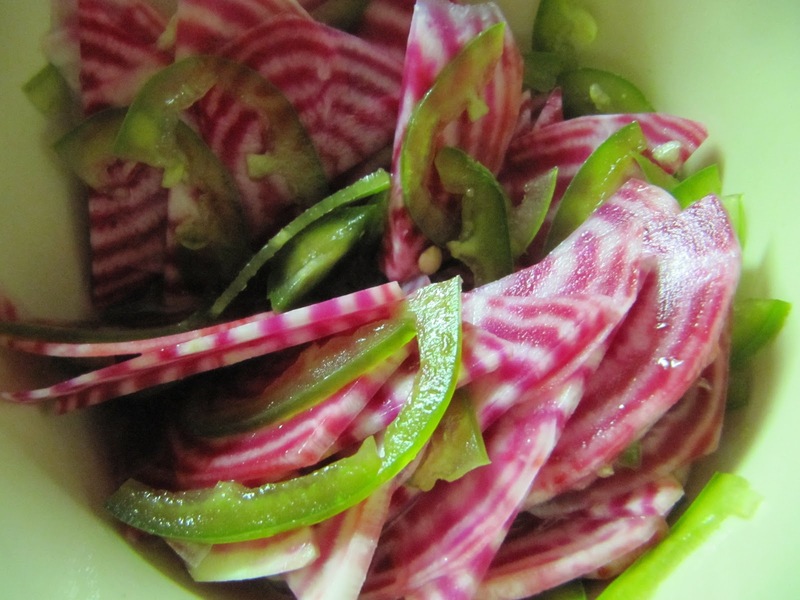 While the pork belly finished cooking, I sliced beets and jalapeños paper-thin and I placed in a bowl with white wine vinegar, salt and pepper. I let this sit for at least an hour, allowing the vinegar to combine with the beets and jalapeños, softening them up a bit. Once the pork belly was out of the oven, I chopped up the meat including the skin and begun to construct my tortas. I sliced the bolillo in half before slicing it open to make smaller , more manageable portions. I filled each bolillo with pork meat and topped with a few slices of pickled beet and jalapeños. That's it, the fattiness of the pork provides more than enough moisture for the bread and the vinegar in beets goes well on top of the meat. For my ceviche I decided to go with cod. 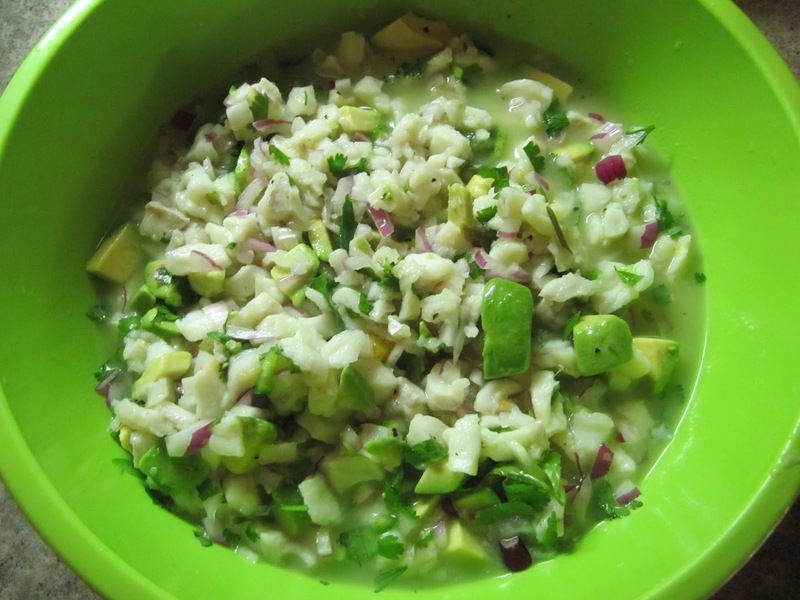 I love making ceviche and it is always good with a crowd of people. The idea behind ceviche is that raw fish basically "cooks" in acid. For my version I marinated cod in lime and orange juice. It is important to cut the fish into bite-sized pieces, a bit larger than a dice. This will allow the acid to fully cook the fish. There should be enough lime and orange juice to fully cover the fish. The fish should marinate in the refrigerator for 3 to 4 hours. This can go longer but you run the risk of the fish being tough. Once the fish is done, little needs to be done to complete the ceviche. I simply added diced onion, diced chile serrano, minced garlic, diced avocado, chopped cilantro, salt and pepper. I stirred to combine all the ingredients and served with tortilla chips. Normally this is eaten on a tostada but I felt the chips worked well and were more conducive to beer drinking and hanging out. To round out our meal, I decided to use a couple of spring vegetables, prepared very simply. 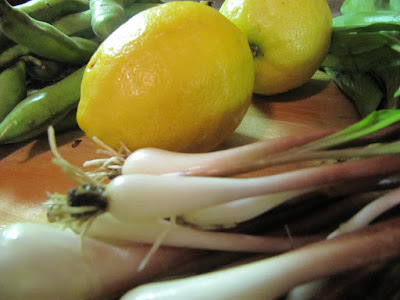 I recently went to the store and saw ramps and fava beans for sale. Admittedly I do not have much experience with either of these but I have heard they are quite delicious and a must-have when they are in season. This simple salad was made by sauteing chopped ramps in olive oil with fava beans that have been removed from the pods, blanched and peeled. 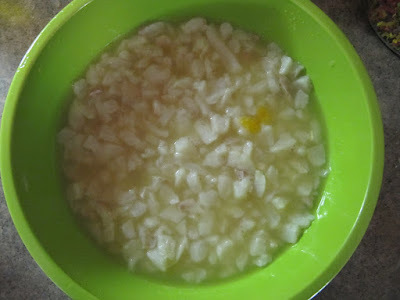 I added the zest and juice of one lemon, seasoned with salt and pepper and tossed until all the flavors came together. These vegetables didn't need much more than just their own natural goodness. I was very glad to have had the opportunity to cook for our friends. We have enjoyed such great food at their place that it was really good to hear that they enjoyed it.